Nowadays everyone is inclining their mindsets toward modernity whether they have to design their homes or its interiors. The kitchen in the above picture is a perfect example of modern interior designs. From the choice of colors to the design of the furniture and fixtures everything is very contemporary and is well off with the theme of this kitchen. 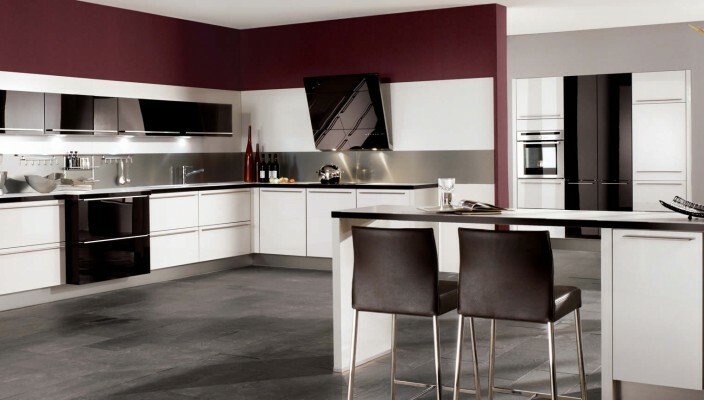 The theme of the room comprises of three main solid colors that are maroon, white and grey. This color contrast is not just a modern combination but also very simple and sober. This kitchen is quite spacious and can be used by several people at one time. Equipped with latest kitchen wares and appliances this kitchen also consists of a dining area for two. Since the major part of the walls and closets are white this place is adequately brightened. In addition the use of grey and maroon does not make the room look dark and gloomy. Is your Home Security as Good as it Should Be?